Will Keylor Navas Be The Next Goalkeeper of Real Madrid? 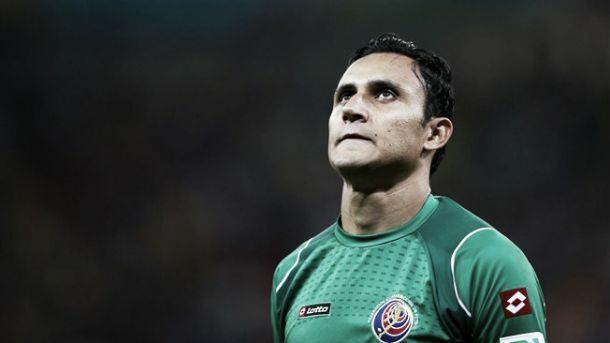 Over the next couple of days, the Costa Rican goalkeeper Keylor Navas should be announced as Real Madrid’s new number one for the season to come. According to the Spanish media, Keylor Navas will sign a five-year deal with Los Blancos and this will cost them something around the £8 million mark. The current Levante goalie is one of the most wanted players currently in the market and after a fair deal of speculation concerning his transfer, with Bayern Munich, FC Porto and some English teams trying to grant his services, Keylor Navas will surely move to Madrid to fight for a place at Carlo Ancelotti’s super team. Will Keylor Navas be able to replicate his last season with Levante at Real Madrid? On 2010, the Costa Rican arrived at the Old Continent to play for the historical but currently modest Spanish side of Albacete, following the footsteps of his fellow countryman Luis Conejo, who was considered the best goalkeeper of the 1990 World Cup tournament. Keylor Navas failed, however, to replicate Conejo’s glorious past at Albacete as he only managed to take part in thirty-six matches in two seasons. Although he failed to show all his quality skills at Albacete, Navas joined La Liga’s side Levante, first on loan and later on a permanent deal in 2012, where he backed up the experienced Uruguayan international goalie Gustavo Munúa. After Munúas’ departure in 2013, Navas cemented his position at the team and embarked on what would turn out to be the best season of his career at the Comunidad Valenciana’s team. Keylor Navas was one of the most impressive goalkeepers of La Liga last season and probably didn’t win the Ricardo Zamora trophy only because of Thibaut Courtois’ fantastic season with Atlético Madrid. Not only did Navas help Levante to secure a place at La Liga, he also helped them grant a place at the top ten by putting up some unforgettable performances throughout the entire campaign. Notwithstanding, the next season will probably be different for the new Costa Rican superstar as he will certainly face some strong competition at Real Madrid. The team’s captain Iker Casillas lost his place at the starting line-up in La Liga’s matches for Diego López and his performances at the World Cup were nothing short of disastrous. There are plenty of rumours that he or even Diego López might be on their way out of Madrid, something that would indeed make Keylor Navas’ introduction much more easy at Los Merengues. Anyway, even if both them stay at Madrid and if Navas manages to continue his outstanding recent moment, neither Casillas nor Diego López should be able to offer him strong competition. It will certainly be interesting to see if the 27 year old Costa Rican goalkeeper will manage to impress Carlo Ancelotti and if he will be able to “relegate” the current Spanish number 1, Iker Casillas, to yet another bench warming season. How Can Toni Kroos Improve Real Madrid's Midfield Line?